Rugged built Mass Air Control helmet ventilation system provides high volume clean air in the harsh off-road environments. Machined from a solid block of billet aluminum and wrapped with real carbon fiber, the MAC1 is truly built for offroad. Providing a constant 135 cfm air flow with only a 2.9 amp max draw, the MAC1 runs continuously with quiet operation. Filter the outside air with the race proven AIRAID multi-layer filtering system with Lifetime Guarantee. Further protected with a slip over Pre-Filter, even the finest dust and silt won’t clog up during a 1000 mile race. Easily mount vertical or horizontal with the optional Rugged bar mount available in 1”, 1-1/2”, 1-3/4”, and 2” tubing sizes. Simply use two bar mounts (available from this link) to mount the unit close to your seat. For best performance and maximum air flow, use the shortest length of hose you can comfortably ride with (sold separately). 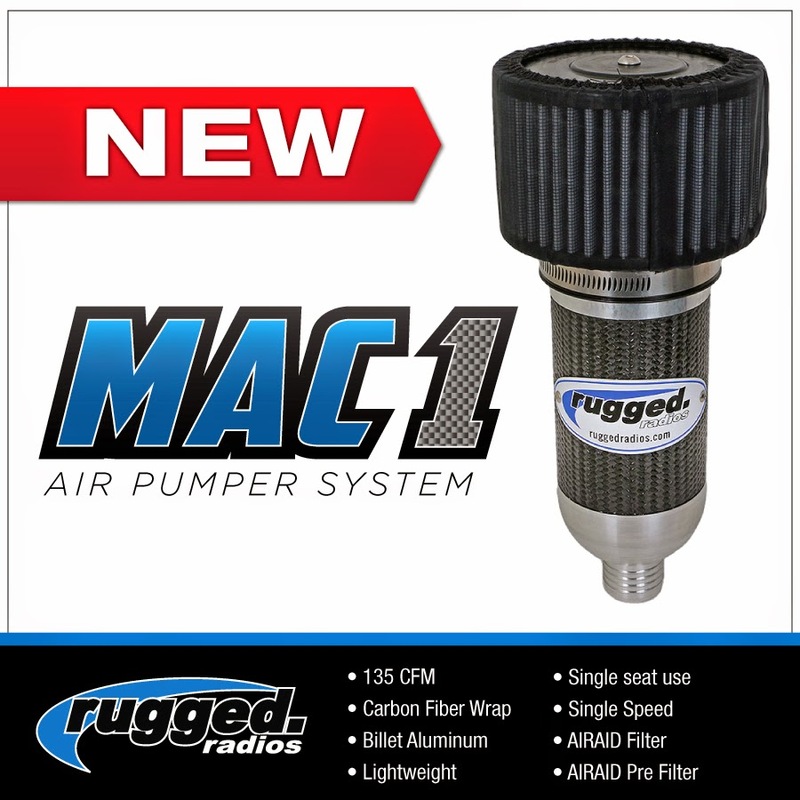 The MAC1 by Rugged combines constant air flow, quiet operation, billet aluminum and carbon fiber materials. The hardest working helmet air system in the industry! Rugged Radios has everything you need to complete your communications setup in your offroad truck, Jeep, sand car, sand rail, dune buggy, or UTV. We offer helmet, headset, and complete communication systems allowing you to talk from driver to passenger or UTV to base camp or another vehicle. Options allow you to choose from basic intercom setups to our most popular intercoms which allow you to hook up your iPod (or other MP3 player), a cell phone to make and receive phone calls, and VOX capability so the music automatically mutes when you speak to fellow passengers. From the offroad regions of Baja to sand buggies at Glamis Dunes to UTV’s like the RZR, Rhino, TERYX and more — we are the authority in communications and we’re here to get you talking! For more information, visit www.ruggedradios.com and follow on Rugged Radios Facebook page to keep up with the Rugged Radios team.